Katie Jane is hull number 19 of the popular Nordhavn 57 run. 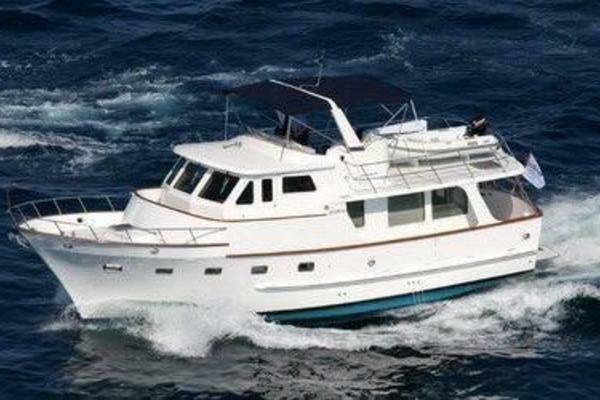 She is a 3 stateroom, walk-around body, traditional pilothouse version, in immaculate condition throughout. Her upgraded glass bridge electronics in the pilothouse dash and her new dark granite and stainless galley appliances have created a modern look seldom found on older Nordhavns. Originally commissioned and serviced by Yacht Tech in Florida, we continue to maintain the records of this vessel from the original unloading in Miami through three sets of owners. The present owners have cruised this beautiful vessel from the West Coast of the USA across the Atlantic and around the Mediterranean. Katie Jane is fitted with both 50hz and 60hz generators, inverters, power outlets and equipment. She is able to plug into both European and US power and with her narrow body and custom, remote hydraulic passerelle, she is perfectly set up for "Med" style moorage. She is currently at the prestigious Cote d’Azur berth in Menton France, Renewal available for future years. The Nordhavn 57 is a full-displacement passagemaker with all the necessary features of an ocean crosser. The construction is to the same heavy scantlings as her sister ships, but the design differs in styling and interior volume. The 57 maintains a rugged, commercial look while interfacing a contemporary elegance, and offers a level of performance that expands the envelope of top cruising speed and long range potential. The hull and its bulbous bow have been fine-tuned at the Engineering Facility at the University of British Columbia. Maintenance Strakes have been developed which maintain a moderate draft, and freeboard and superstructure height. The maintenance strakes not only provide added engine room height but enhance the vessel's performance by up to 2 percent depending on the speed selected. Working in conjunction with the bulbous bow, the strakes have a positive effect on the wave-making characteristics and reduce resistance. A combination of a parabolic-shaped bulb, fuller sections aft, and a stern designed to minimize drag-inducing suction at high cruising speeds, allows this vessel to run efficiently at speed - length ratios of 1.6, or approximately 11.5 knots. There is a minimal efficiency penalty at lower 'ocean crossing' speeds, but this does not affect capability due to the vessel's substantial fuel capacity. The 57 offers cruising speeds above what is normally possible in a full-displacement hull while maintaining the benefits of this hull form, such as ocean crossing capability, reduced noise and vibration levels, heavy construction scantlings, and greater safety - comfort. For semi-planing hulls to achieve planing speeds, weight must be minimized which adversely effects seaworthiness and long-range capability. Additionally, the seakeeping qualities of the higher-speed models are compromised due to their light displacement - length ratios, small rudders, and shallow keels. The 57 features an interior volume - overall length ratio higher than previous Nordhavn designs. This increase in space is due to a greater beam - length ratio, increased volume in hull sections, and the beam carried farther aft. Additional innovations include a walk-in engine room with dual work benches, a deep lazarette with shelves, a large cockpit, a swim platform with access door, a large flybridge, and fiberglass fuel and water tanks. The large cockpit on "KATIE JANE" measures over 7 ft. long by 15 ft. wide. A standard integral fiberglas swim step located aft of the transom has been given an additional custom slatted swim platform, adding valuable waterline length as well as making stern boarding convenient. The cockpit is also equipped with built-in storage lockers, and a generous lazarette featuring an access door forward into the engine room. Inside the salon, a custom finished adjustable table with seating is located to port. The galley is forward to port, with an access door for provisioning, the washer/dryer and engine room access to starboard. Several steps up lead to the large pilothouse with helm chair, L-shaped seating and table, port and starboard pilothouse doors that access the Portuguese bridge, and a separate set of interior stairs that lead to the flybridge. Continuing forward from the pilothouse to starboard, you descend a set of curved stairs leading to three separate cabins along with two separate heads and showers. Guest stateroom set to function as both office and two bunk berth stateroom. All critical electronics have completely independent redundancy. Two AP’s, two Radars, two depth sounders, and two charting systems.